Joe Biden had reached the end of the line. Nothing to do with his swine flu gaffe, but our Vice President was more or less positioned literally at the southern edge of a unique rail network. He focused on a more prominent train system, namely Amtrak, but from where he stood - at Wilmington’s station - he could have traveled far more cheaply to Philadelphia, through New Jersey to Manhattan, and even to Montauk and Port Jervis, and indirectly to New Haven and Poughkeepsie. We know of Amtrak’s reach, but not mentioned in news reports of the event is the inter-connected commuter rail network that runs parallel to the Amtrak trains in the Northeast at a lower cost. In the process, the network helps to keep Jewish communities connected, though not connected enough. Consider that Jewish communities dominate throughout the Northeast. A contiguous network of Jewish communities threads from New Haven, Conn., south to, well, Wilmington, along with numerous branches through Long Island and North Jersey. In combination with Amtrak, large Jewish communities north to Boston and south to Baltimore and Washington, D.C., are accessible. With all the available connections, a University of Pennsylvania student from Suffern in Rockland County, N.Y., can return home by picking up the SEPTA train at 30th Street to Trenton, switch to a New Jersey Transit train and transfer to a Suffern-bound train at Secaucus Junction where nine NJT lines converge. When he courted Hadassah, Joe Lieberman could have traveled 70 miles from New Haven to 125th Street in Harlem and switched to a Hudson line train to a station near Riverdale, where the Connecticut senator’s future wife lived at the time. This inadvertent network coordinates among six separate transit systems through some of the heaviest Jewish populations in the country. From Wilmington, a passenger can board a SEPTA train - the system serving Philadelphia and its suburbs - for 30 miles to downtown Philly and switch to a second train for another 30 miles to Trenton. Next step: Ride NJT another 60 miles to Penn Station in Manhattan. One can yet travel from there to Great Neck, Long Beach, Huntington and even the Hamptons via the Long Island Rail Road. Too bad none of this was mentioned, at least in news reports, when the Vice President returned to his old stomping grounds in Wilmington on Monday, May 4, to herald the administration’s $1.3 billion allocation for Amtrak capital projects, including $21 million to rehab his home state’s station. 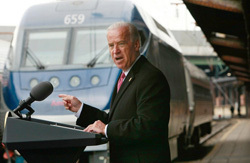 Biden passed through the station countless times to commute to Washington on Amtrak when he repped Delaware as a senator. Interestingly, the Wilmington announcement was followed on Saturday, May 9, by National Train Day, which marks the completion of the transcontinental railroad in 1869. Wilmington is actually SEPTA’s third most southernmost station, but the two beyond it are barely used. The region also covers a sizable if not so visible Jewish community estimated at 15,000. Jewish residents are supportive enough to have renovated and expanded the local Jewish Community Center a few years ago. This commuter rail network has plenty of flaws. Its most prevalent drawback is being too short. Or, Amtrak is not financially accessible even to the middle class. Amtrak is too expensive, which leaves riders no options where a commuter system does not exist. From Philadelphia to New York, a round-trip package combining rides on SEPTA and NJT costs $37.50, one-third the cost of riding Amtrak. There are even other cheap alternatives to Amtrak. There has been no viable alternative to Amtrak if one’s destination is Baltimore or Washington. The round-trip costs from Philadelphia to Baltimore and Washington last summer were in the range of $100 and $140, respectively. Washington is, naturally, an important city to visit for many reasons, but specifically it is a wonderful opportunity for Jews to tour the United States Holocaust Memorial Museum. Middle-class visitors can barely afford the cost. As press time arrives, The Philadelphia Inquirer reported on May 20 that Amtrak rates are being sharply reduced this summer. Some Philadelphia-Washington trips are listed on the Internet as $33 each way. Credit President Obama and Congress for increasing expenses for Amtrak, but passenger prices are too high. I often ride commuter rail to New York, but I could not afford to ride to Washington so frequently. A round-trip cost of $50 would be reasonable. For that matter, commuter costs have gotten too steep. What could be dubbed The Times Square Gap is the second most serious flaw in the system because Metro-North, which serves Connecticut and Westchester County, does not hook up with the other systems. A train from New Haven or White Plains ends at Grand Central, 1 ½ miles from Penn Station. To reach Grand Central, a passenger who arrives at Penn must spend $2 for the #1 subway train one stop north to Times Square and transfer to the Grand Central shuttle train. Actual riding time is two minutes on each train, but the entire trip takes 20 minutes. One would think that New York commuter lines would be physically integrated, as are those in Philadelphia and Washington. Unlike Philadelphia, the NYC region had no rail links to any of its three airports until a few years ago. Now special trains link the LIRR to Kennedy and the NJT to Newark. Another great stride was construction of the Secaucus junction where nine NJT lines come together, just a mile or so before the tunnel under the Hudson. Previously, trains from near Teaneck, Morristown, Rockland County and western Essex County towns ended in Hoboken and passengers had to transfer to another rail system to cross into Manhattan. With Secaucus, those passengers can get off there and switch to other NJT trains heading straight to Penn Station. On the books are plans for another Hudson tunnel, expanded rail service in Bergen County and an LIRR stop at Grand Central. Nifty network, one that can only enhance Jewish community. Oh, yes, Atlantic City Jews have available to them a long-running NJT line to Philadelphia, which of course connects them to the rest of the system; this is separate from a new, more expensive line directly linking AC to NYC. The only risk with the older line is that Philadelphians still traveling to the casinos better be sure they have $8 left for the return trip.